Click here for 39 full quotes from Mitt Romney in the book Mitt Romney: An Inside Look, by R.B. Scott. 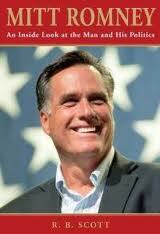 This is the first biography of Mitt Romney written by a Mormon. It's not explicitly about Mormonism at all -- but the author is a Mormon who knew Romney well through church ties, and who evidently did not like Romney very much. Hence it is an unauthorized biography, which to readers means it is more honest than one which must pass muster with the Romney campaign. The author Ronald B. Scott, is a staff writer for Time Magazine, and a founding editor of People Magazine. He is also a distant cousin to Mitt Romney, noting "It is a classic Mormon arrangement--we share the same great-great-grandfather but different great-great-grandmothers." (p. 246). The author presents a lot of background from Romney's past--they met when both were teenagers--but no big new revelations about Mormonism nor about any family secrets. Instead, this is a solid background book about Romney's family and personal life, and a solid analysis and review of his issue stances. Those issue stances have evolved over time from his 1993 Senate campaign through his 2002 gubernatorial campaign through his 2008 presidential campaign--as every pundit has expounded upon. This book provides numerous new insights into the evolution of Romney's stances, often focusing on how the Mormon church viewed the issue and how Romney reconciled his views with the church's views. 2004: Stem cell research ok, if privately funded. 1993: Personally opposed, but let women decide themselves. 1993: Morning-after pill could make abortions obsolete. Contraception is a personal choice; but advocate abstinence. 2003: $500M budget cuts, including aid to cities. Stimulus package declares war on free enterprise. Obama's policies made economy & stock market worse. America needs less spending and more jobs. 1994: Supported ENDA to ban anti-gay employer discrimination. Support gay rights but opposes gay marriage. 1993: Denied ever calling homosexuality "perverse". 2003: Worked with cities to prepare for gay marriages. 1994 labor strike: no insurance for part-time employees. Adopt reasonable compensation incentives for CEOs. Everything corporations earn also goes to people. Humans contribute to world getting warmer. Reduce dependence on oil, not just on foreign oil. Opposed Cape Cod rail extension, but listened to all sides. OpEd: Scapegoated head of Mass Turnpike for Big Dig disaster. If America fails to protect against China, we'll be eclipsed. 2004: Disallowed from appointing Kerry's Senate successor. 2002: I will not chip away at MA's tough gun laws. Over 98% of MA residents now have healthcare. 2008: Individual mandate ok; free ride is not. 2010: Consider single-fee structures, at state level. My plan right for MA but wrong for rest of country. Donates to groups that support the military. Post-9/11: monitor and wiretap mosques. I don't believe in rounding up 11 million people. Current system is concrete wall against best & brightest. OpEd: Never accepts "no"; but doesn't read people well. Wife Ann's father was mayor of Bloomfield Hills MI. 1994: Kennedy attacked Mormonism; bishops defended Romney. OpEd: 1994 race gave Kennedy the scare of his political life. OpEd: SLOC's real need was fundraising and media relations. Paid college students 10% of dollars fundraised for him. 2010: Obama passes citizenship test; no more Birthers. 1996: flat tax is unfair to the middle class. 2002: refused to sign gimmicky "no new taxes" pledge.